The release of a book by former Defense Secretary Robert Gates that criticized the Obama administration drew even less interest than news about Christie. Just 11% followed news about Gates’ book very closely. Those who followed news about Christie’s apology at least fairly closely are more likely to have changed their opinions about the New Jersey government in recent days. Nonetheless, 57% of those who tracked news about Christie say their opinion of him has not changed; 29% say it has become less favorable, while 11% say it has become more favorable. Republicans are about as likely as Democrats to have followed the Christie story at least fairly closely last week (43% vs. 46%). Like Republicans overall, those who followed the story at least fairly closely are closely divided between those who are more favorable to Christie (18%) and less favorable (17%), with 62% saying their opinion hasn’t changed. Democrats who closely followed Christie’s apology have come to have sharply less favorable opinions of Christie: 43% say their opinion is now less favorable, 3% more favorable, and half (50%) say their opinion hasn’t changed. The most closely followed story of the week was the cold winter weather that swept much of the country. About three-quarters of the public followed the news very closely (44%) or fairly closely (32%). Attention was lowest in the West, where 28% paid very close attention to the news, compared with 55% of those in the Midwest, 51% of those in the East and 43% of those in the South. About three-in-ten (28%) very closely followed reports about the U.S. economy, while two-in-ten (19%) very closely tracked the debate in Washington over extending long-term unemployment benefits. 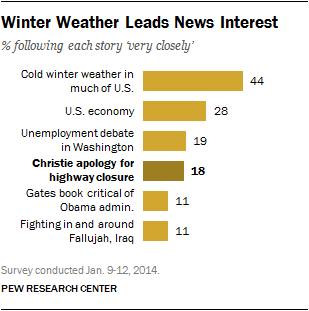 Overall, 18% say they followed news about Christie’s apology for the lane closures ordered by his aides very closely. Interest in this story was higher in the East (26% very closely) and Midwest (23%) than in the South or West (14% each). Just one-in-ten (11%) very closely followed news about former Defense Secretary Robert Gates’ new book, in which he is critical of the Obama administration. An identical percentage (11%) paid very close attention to the fighting in and around the Iraqi city of Fallujah. More Republicans (17%) than Democrats (7%) very closely followed the story last week.